Finding Disney:Griffith Park Merry-Go-Round-Where Disneyland Was Born! Finding Disney: Griffith Park Merry-Go-Round, Where Disneyland Was Born! It’s time for the second installment of my new blog post series “Finding Disney“! If this is your first time reading, Finding Disney is what I am calling my bi-monthly series where I go to explore Disney things and places outside the Disney Parks. For my first post, I explored a day at The Walt Disney Family Museum in San Francisco, CA. This next time, I spent an evening at the Griffith Park Merry-Go-Round in Los Angeles, CA. One day while taking Sharon and Diane to the Griffith Park Merry-Go-Round, Walt Disney was sitting on a bench watching them enjoy their time, and he wanted to come up with something even bigger that they could all do together as a family. It was this Merry-Go-Round that inspired his dream and idea to create Disneyland! From the moment you park your car, you feel a sense of wonder and magic around the merry-go-round site. When you see it in a distance among green grassy hills, with the San Fernando Valley mountains in the backdrop, and nestled in between it all a red-and-white roof with yellow lights. It looks like a scene from a dream! You expect most merry-go-rounds to be in the middle of a bustling area or theme park, but this merry-go-round is in the middle of a quiet part of Griffith Park, making it feel like somewhat of a hidden gem. When you’re there, you truly feel an intimate experience with your family, since it feels like there’s nothing else in the world to distract you. It really puts your focus on enjoying a merry-go-round ride with your family, while taking in the beautiful antique horses and rich sounds of the organ playing along with each ride. At $2 a ride (FYI, it’s cash only so come prepared), it’s a fun thing to do a few times! When I went with my family, we went to the concession stand to get a few rides off the bat, as well as get some quarters in change to get some candy and small toys in the quarter machines outside the merry-go-round, as well as a mechanic horse you can ride for 50 cents. Also outside the carousel gate are souvenirs for purchase, that are a rather good price! They have pins, vintage looking postcards, and even Griffith Park Merry-Go-Round coloring books for $3. On your way out, the employees at the merry-go-round don’t rush you out, which makes sense since inside the merry-go-round space they have quite the item on display: The ACTUAL bench Walt Disney sat on where he was inspired to create Disneyland. That’s a lot of history to experience and see for just $2! After riding, we got some snacks at concession and enjoyed eating them at a picnic bench facing the Griffith Park Merry-Go-Round and listened to the beautiful Stinson organ, feeling that same magic Walt, Sharon, and Diane felt many decades ago. 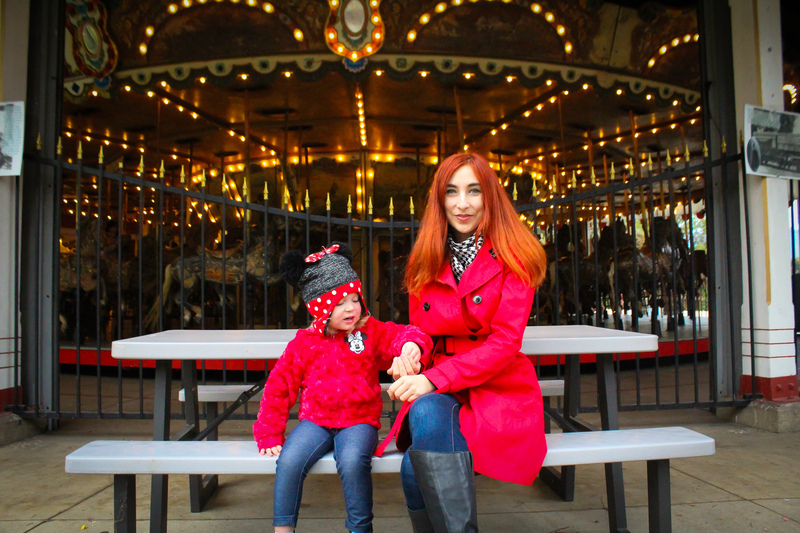 The Griffith Park Merry-Go-Round is cash only, open 11am-5pm on weekends and everyday during holidays.